It seems that even among Jesus’ disciples, Mary played a privileged role. Why, then, did the Roman Catholic Church feel obliged to almost entirely erase this female figure and her role? Was it because of a now proven anti-feminism that existed at the heart of the Church from the early Middle Ages? The Christian conception of femininity, which has certainly greatly evolved in the modern world, especially since the council of Vatican II, is due both to Greco-Roman legacy and to the Hebraic options. With the exception of the female characters of Genesis, who are gripping figures to say the least, the scribes of the Bible lowered the status of Woman by making her impure and thus not apt, for example, to play a sacerdotal role. The idea that Mary Magdalene enjoyed total equality with the apostles has never crossed the minds of Church theologians. Because priests are the legitimate heirs of the apostles, such a standing would make Mary Magdalene, on the one hand, a priestess--how horrible!--and on the other, one of those on whom the apostolic sacerdotal filiation was founded. Yet, when Mary of Bethany washes Jesus’ feet and anoints him with precious perfume, which Judas, the group’s treasurer, believes could be put to a more profitable use, she and Jesus are enacting a kind of sacerdotal and royal ordination--with Mary serving as the priestess who performs the ritual. Is it forbidden to think that Mary of Bethany, over the course of those long moments spent at the feet of the Lord, could have heard what he had to say or at least sensed the full scope of Christ’s mystery even if she did not grasp it in its entirety? Jesus persistently tried to lead his disciples to realize this--if only in the éclat of the Transfiguration!--but their hearts remained curiously closed all the way to the end. Mary, however, did perceive and accept it. On that day she knew the moment had come to manifest this mystery in chiaroscuro. In a kind of prophetic intuition . . . Mary anointed the head of Jesus, recognizing and presenting him as King and Priest, and anointed his feet as Messiah sent from God. At that time there were two sites named Bethany: a town two miles east of Jerusalem, where Mary, Martha, and Lazarus lived; and on the left bank of the Jordan, at a ford just before the Dead Sea, where John the Baptist baptized. In addition, there was a place called Bethabara, “house of passage,” by the gates to the desert. John the Baptist and later Mary, each in their own way, granted baptism, initiation, the right of passage, or the means of crossing the threshold. The two Bethanys, then, seem to mirror each other. Magdalene extends the echo of her precursor, John the Baptist. One is a man clad in hides and the other is a woman clad in her long mane of hair. The chief difference between them is that John remains in a harsh and terrible place, screaming in Essenian rigor his curses and his calls to repent, whereas Mary in Bethany, on the opposite where all is blooming and gay, speaks of love and forgiveness and the transition from one world to the next. While Jesus received from John a baptism in water, he did not receive, as the ancient kings had, a consecrating anointing with oil. Just before his Passion and “baptism by spirit and fire”--the crucifixion--he received the perfumed oil from the female Magdalene. The old and ancient notion of the priest-king applies to Jesus, but this royal unction, let me repeat, can only be performed by a priest--or priestess. The unction in Bethany is surely one of the most important events in the life of Jesus. Furthermore, this is what Jesus himself says to his disciples who are always more or less hostile toward the whims of Woman: He declares to them that this woman truly did “what she had to do,” and even adds, according to Mark 14:9, “In truth, I declare to you, everywhere the Gospel is to be spread, throughout the whole world, one will also recount, in memory of her, the deed she has done.” This is acknowledgment of an uncommon power possessed by Mary that went far beyond a mere gesture of female vanity, which is clearly what the first disciples thought it to be, and underscores the importance Magdalene was given in the very words of Jesus. Why, then, was Mary Magdalene relegated to such a minor role in the evangelical tradition as revised and corrected by the Church Fathers? Is the Christian sacerdotal class ashamed to owe so much to a woman? And I cannot forbear from asking myself: what has the memory of the Church done to these words of Jesus? Isn’t there something yet to be explored there? And wouldn’t this something be the consecration of a specifically female ministry of a prophetic and charismatic nature that Jesus would himself have recognized and proclaimed as existing in tandem with the apostolic and sacerdotal ministry? What a unique place woman would hold in the very heart of the Church if this was the case! The question certainly has been raised--and it seems that Abbe Saunière may have answered it in his own way in the church of Rennes-le-Chateau. ". . .combines philosophy, research, vivid drama, history lessons, and a murder mystery....may shake the foundations of Christianity. . . .The book will appeal to spiritual seekers, as well as [those] interested in conspiracy theories." "This is a great read, a well written story, and an insightful view into the Rennes-le-Chateau tale. 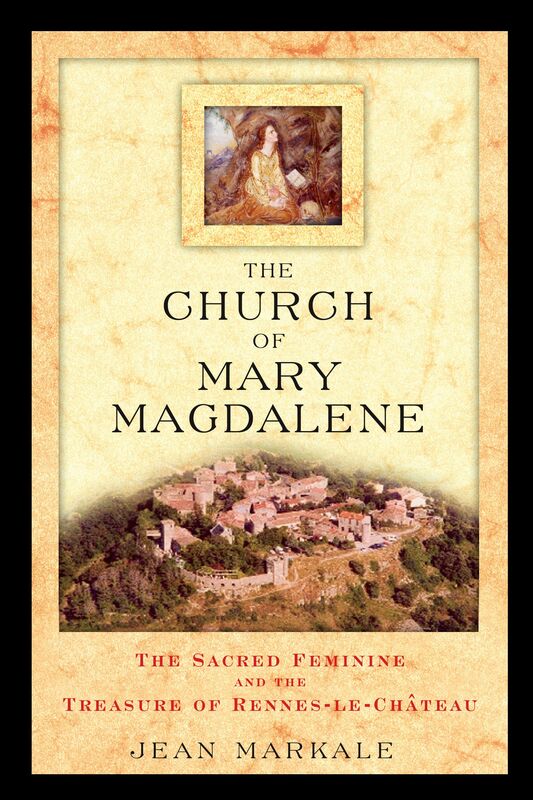 . . .uncovers the key to the suppressed role of Mary Magdelene in Christian history." ". . . an astute, scholarly, investigative book . . ."
"Markale, a historian who was a specialist in Celtic studies at the Sorbonne, combines his extensive knowledge of the Rennes region with a storyteller's flair to produce a book that is as entertaining as it is informative." ". . .the kind of writing that makes the reader want to pull an armchair up to the fireplace, pour a glass of sherry, and settle in for a good yarn."